Yalla, Y'all! : Workshops & Hafla at Sulukele in Athens This Saturday! Workshops & Hafla at Sulukele in Athens This Saturday! 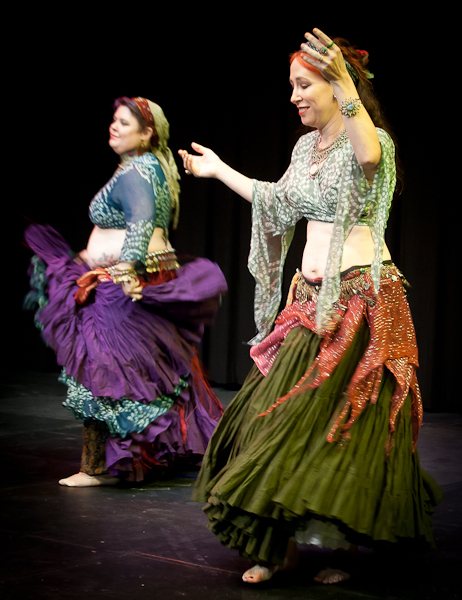 This Saturday, August 27th, Sulukele & Christy Fricks Bellydance will be offering two unique workshops at Floorspace Studios in Athens, followed by a hafla with performances, food, and general merriment! From 1:00 to 2:30, Rajni will teach a workshop introducing the Tribal Odyssey Egyptian group improv format. Tribal Odyssey Belly Dance (TOBD) is a style developed by Kawakib of Fredericksburg, VA in collaboration with Miramar of Winchester, VA. It uses natural posture and both sides of the body in combinations based primarily on Egyptian beledi-style movement. Flexible formations allow any number of dancers to participate. From 3:00 to 4:30, Christy will teach "Turkish Spoons for Dancers, Musicians, and Everybody Else!" She'll review the history of Turkish spoons, how to play them, basic rhythms and some basic dance moves. By the end of this workshop, participants will be able to dance and play along to a traditional Turkish song! At 6:30 p.m., the hafla starts! Bring a $3-5 donation and a dish or beverage to share. Click here to learn more and pre-register! RSVP to the Facebook event here. Here's Christy performing with Turkish spoons! "Najm al Raqs" Brings Nath Keo Back in October! New Classes with Lacy Perry! Get Ready for "AFBD's Got Talent!"